Last Friday morning a motley crew – Mark still none the wiser about his eventual destination – assembled at The Four Seasons Hotel in Canary Wharf for a slap-up breakfast and a few exploratory glasses of Champagne. Not bad: suitably plush surroundings in a modern kind of way; decent enough breakfast; nothing particularly special except perhaps the bill. A good start to proceedings. Two or three hours later, thanks to the oh-so-civilised City Airport, we touched down in Nice. Mark by this point was becoming increasingly suspicious about our assertions concerning connecting flights to Kazakhstan. 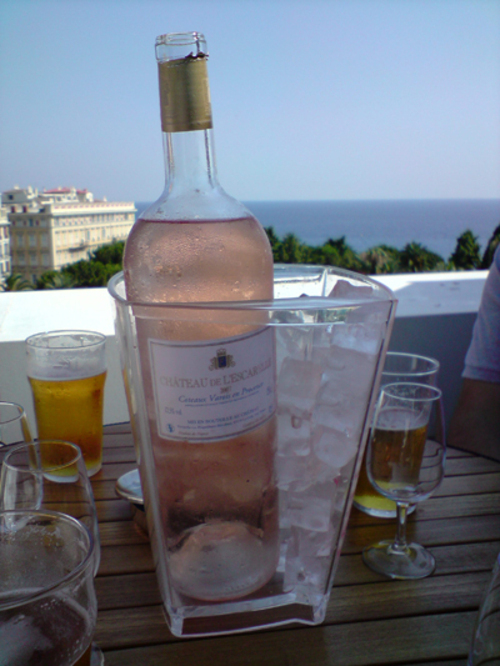 Our hotel turned out to have a terrific roof bar where we indulged in an enormous bottle of pink stuff in the afternoon sun. A couple more in another bar on the beach and we were ready for the evening festivities. In a tiny village in the hills overlooking Nice is La Chaumière, a restaurant short on menu but long on character. We were asked simply whether we wanted beef or lamb, the tempting-looking chickens alas being reserved for those who'd ordered them in advance. And then we sat back and ate royally as a procession of treats were brought one after another to the heaving table. There was wafer-thin ham that simply melted in the mouth, tiny olives that packed a real salt punch, an enormous arrangement of raw vegetables for the table to share crudité style that wouldn't have looked out of place in a fancy hotel lobby. And lots of top quality meat, all of it cooked in the fireplace along with ash-baked potatoes. Probably some pudding too: memory fails me now. All in all a good experience and one that I'd definitely try again, but this is not a meal that comes cheap: the food is a cool €80 for what is nothing more than accomplished but basic cooking and the wine list apparently offers little under €100 (I didn't have a look but I could tell the chaps at the other end of the table were struggling to find something suitable for the party). Back to Nice for a few more drinks on the roof and a couple of hours of mixed fortunes in the casino next door. So far so good. The main event was scheduled for Saturday: lunch at the Louis XV in Monte Carlo. So after some of us treated the stag to a chopper flight (natch), we sat down in one of the most opulent and beautiful rooms most of us had ever seen. (I'm excluding James here: in my imagination he eats in rooms like this every day. In between trips to Nandos.) This wasn't, alas, the occasion to sample the full delights of Alain Ducasse's menu, but we saw and tasted enough in the excellent value seasonal lunch menu (€130 including wine) for most of us to vow to return. In a pocket-sized homage to the raw veg the night before we started with a pretty arrangement of very simply prepared summer vegetables in a tumbler. There were thinly shaved and/or sliced celery and fennel hearts, impressively geometric curls of salsify and the like, batons of cucumber and a few delicate leaves of this and that. Individual bowls of a herby dipping sauce set things off perfectly. Immaculate ingredients, simply prepared. A dish less likely to please a stag party it is hard to imagine but we put it away efficiently enough in between samples from the excellent Champagne trolley. The Louis XV, incidentally, has an awful lot of trolleys. I recollect at least one for each of the following: fizz, bread, butter, sugar (and honey and marshmallows, obviously), cheese and brandy. There may have been others. Meals on wheels, Monaco style. While the full menus contained all sorts of modern flourishes (or at least I assume they did: I had them whisked away as soon as I caught sight of the one that had the prices on it), the value lunch menu was dominated by classic dishes given the Michelin 3-star treatment. So I started with vitello tonata, a silky carpaccio of veal slicked with tuna sauce and an arrary of capers. An accompanying toast cleverly captured exactly the same flavours in its topping. 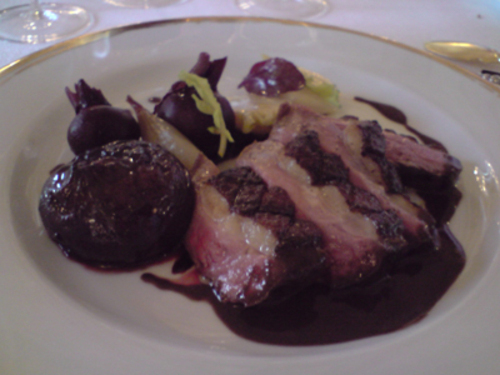 And for main I shared a magret de canard with Mark, any doubts I had about a duck breast being big enough to share quickly dispelled when I tasted the insanely rich fig sauce that came with it. Excellent stuff. There followed a giddy procession of final courses, many from trolleys, including some fabulous cheese (the aged comté stood out), a mascarpone ice cream with wild strawberries and an unnecessary warm sweet syrup, and various coffees, petit fours and chocolates. All in all, an excellent lunch, far better value than dinner the night before and, while we weren't sampling the kitchen at its most ambitious, the majesty of the room and the standard of service contributed to a truly memorable dining experience. The rest of the day was spent in an out of the casinos and bars of Monte Carlo, in a train back to Nice (surprisingly) and in a kebab shop when we got there (possibly). Records from the period are sketchy at best. The final element of the weekend was a real highlight. On the advice of the ever sage Steve Plotnicki, we went to Café de Turin, a fabulous seafood store/restaurant on the edge of the old town in Nice for a last lunch on Sunday. For under £40 a head we ate our absolute fill of exceptional oysters, langoustines, crevettes, brown shrimp, politically incorrect (but fabulous) Alaskan king crab and lobster. Washed down with a few bottles of Muscadet, at least one of which was on the house thanks to their amusement at our wit, repartee and fancy dress. What a treat. Now that is a "proper" Stag weekend. Was you inside at L XV? The terrace is stunning too. You are an excellent best man. What a stupendous weekend you organized! A great read. P.S. I love Nandos. I can't deny it. That sounds like the best weekend ever! Great report; I'm going to Nice in a couple of weeks and I'd love to try some of these places. 1. I think the cost of breakfast may have had something to do with my choice of champagne (+ the quantities of it we consumed), for which I apologise. 2. I'm going back to the Louis XV the weekend after next for the full dinner. Will report back on my return. 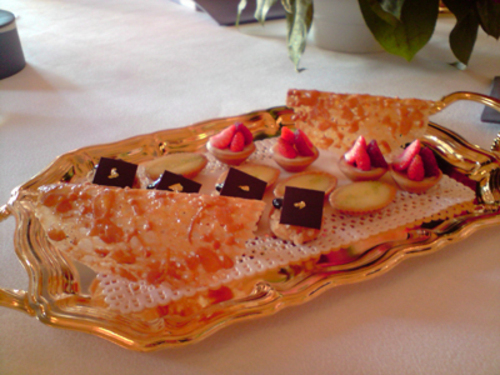 You ate lunch at Louis XV on Friday - I was there for lunch the day before. It is stunning value for EUR 130 given that this includes cheese, and wine, as well as the 3 courses. Mark, no need to apologise: given the way the rest of the weekend was likely to shape up, decent fizz was a prerequisite I think. Andy, we were there on Saturday. Glad you enjoyed it too. And Sam, yes, we were inside but we were still there when the rest of the diners had finished up (imagine) so we took the opportunity to have a drink on the terrace too and watch the Ferraris go by. Lovely.